Our product range includes a wide range of horizontal silo, cement silo, storage silo, fly ash silo, vertical silo and welded silo. Backed by rich industry experience, we are manufacturing and supplying a quality approved an array of Horizontal Silo. The horizontal silo is fabricated from mild steel plate shaped as to ensure to drop the material into horizontal screw conveyor located in the low part of the bin. 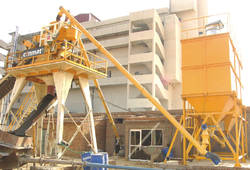 Backed by rich industry experience, we are offering a wide range of Cement Silo. Extensively used in different construction industries for the expanded production of concrete products, this range is developed using quality tested raw material obtained from the most trustworthy vendors of the market. We offer a Storage Silo complete solution to your silo requirements. Quality steel assured plate thickness, sandblasting and epoxy paint improves the life of the silos. This saves your time and fabrication inputs required at the site during erection and installation. 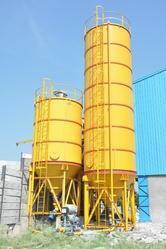 We are also engaged in manufacturing and supplying Fly Ash Silo. Offered Fly Ash Silo are manufactured according to the norms of the industry by using latest machines and quality tested material obtained from the authentic vendors of the market. At the production stages, these tanks are supervised by the experts, so as to develop qualitative Fly Ash Silo and eliminate defects. Silo Costing may vary according to capacity of silo. Vertical Silo offered to come in the precision designed finish so as to provide for high-performance usage support in cement plants.Some of its features include suitable for ready mix manufacturers, expertise in meeting complete solution to silo requirements, quality steel finish, superior paint finish for enhanced service life. Costing of silo may vary according to capacity of silos. Welded Silo with Twin Outlet offered to come in precision designed & constructed finish and finds extensive usage in cement plants. Some of its features include expertise in offering both standards as well as customized end solutions, made from quality steel that provides for lasting usage, sandblasting and epoxy paint finish for improved service life, pneumatically actuated isolating valve fitted to prevent accumulation of damp PAC when screws are not in use, heavy-duty turbine-type mixers. Looking for Industrial Silo ?